Melanie entered the world of dog sports when her Vizsla Sammy was a few months old. That was over 14 years ago. Sammy now has two brothers – Davis is 12 years old and Four is 18 months old. Sammy and Davis are both retired from competition. They’ve competed in agility (NADAC, AKC, UKC, USDAA and CPE), rally (AKC, UKC, Cynosport and C-WAGS), obedience (AKC, UKC and CDSP), barnhunt and nosework (NACSW and UKC). 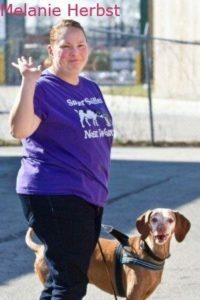 Melanie believes in versatility and keeping her dogs busy physically and mentally. She enjoys teaching beginner classes and witnessing the training progress of “baby” dogs.